I am a tattoo artist in Saskatoon, Sask, Canada. 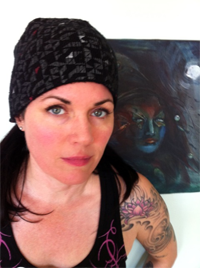 I have been tattooing since 1995 and have a 4 year commercial art degree from Alberta College of Art and Design. I have been drawing and painting my whole life. My tattoo portfolio was presented at the Vancouver Art Gallery for the Pierced Hearts and True Love show while working in BC. I love kids, animals, and original art. Thank you very much for the Tattoo you did for me in memory of my daughter Stephanie. It turned out beautiful. i will be getting in touch with you to ahve another done. Once again thank you very much. i was just wondering what the min. wouldbe for a small tattoo,or a tattoo that takes under an hour . hey what are your age restrictions? Hello I have heard great things about your tattoos and was looking at your pictures they look awesome. My mother and I are wanting to get a tattoo in remembrance of our family dog we had to put down saying “loved never forgotten” with two paw prints on the side. The thing is I don’t live in Saskatoon but she does, I will be in town next weekend and were hoping you could fit us in. Email me back please. You can definatley call me when you get here, I’m pretty booked up, but sometimes people cancel, or don’t need alot of time. hey, do you tattoo fingers? i really want the outline of a heart on the top of my middle finger. thanks! Are you all booked up for the month of Aug? Hi, I was just curious about what the minimum age you’d tattoo someone is? I know for sure it’s manditory that someone has to be 18+ to be tattooed, but is there any exception if say a 16 year old came in with a parent, and the parent has proper ID and gives consent/signs a wavier? You must have a parent sign your waiver if you’re under 18. Different artists have different rules. I generally won’t tattoo anyone under 18 unless I know them already and/or there is a meaningful reason for getting it done (scar coverage, memorial) if I do agree to tattoo a minor, they can’t be younger than 16 for sure and I will refuse certain things. Thank you for your question. After the $80 min what do you charge? I was just wondering if you do temporary tattoos before doing the real thing so I can see how I like it on me before doing somthing permanant. I suggest holding different sizes of photo copies up to where you want to place it. I don’t do temporary designs. They do henna at Changes Spa if you wanted to try that first. hey I was just wondering how much you charge for a tattoo that would take 5+ hours? Hey, I’m looking at getting my first tattoos next month and they’re all just simple short small cursive writing ones that will take under an hour, how much is your hourly rate? Hi my name is Cheryl and Im currently looking for a trained and especially qualified tatoo artist to cover up a dark red(blood colored) name that is about 7 inches wide and 5 inches in length…..in some kind of dark colors over top of it….id much rather have a chest piece then to have it removed….my question is it able to bed covered with darker colors like dark brown and black if its a blood red colour? Moreah is ABSOLUTELY AMAZING! I got a small wrist tattoo and I love it!!!!!! RAD RAD RAD~!!!!! Do i need to pay deposit for an appointment? If so how much would it be? How much is henna eyebrows? Hello my wife and I are planning on a couples tatoo , do you allow others in the room at time of tatoos ? As well can you do a joint consultation ? Hi, what’re you thinking of doing? If they’re fairly small I can allow you to stay in the room. Hi, it would be 80.00$ if the design is approved by me.